MARINE CORPS AIR STATION MIRAMAR–In an extraordinary display of raw power, military might, and operational readiness, ground and air crews from Marine Aircraft Group (MAG) 11, 3rd Marine Aircraft Wing (MAW), launched more than 35 aircraft near simultaneously in support of scheduled training Friday. As the sun rose over the eastern mountains, the aviators emerged from their hangars and quickly readied their aircraft. 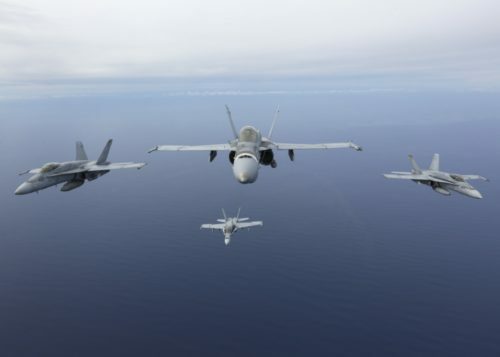 Within minutes, more than 30 F/A-18 Hornets and 2 KC-130J Hercules started their engines and moved to the taxiway; forming a line, known as an “elephant walk,” which stretched nearly a mile. were immediately followed by the next four aircraft; a process that continued until all the aircraft were airborne.